Aston Villa are all but relegated after a defeat by Bournemouth - their eighth in a row - left them 15 points from safety with five games left. Steve Cook's close-range finish set the visitors on their way before Joshua King scored after a defensive mix-up. Jordan Ayew reduced the deficit with a powerful shot beyond Artur Boruc. Villa need to win their remaining five games to have any chance of staying up, but could be down before they play at Manchester United on 16 April. The Birmingham side could be relegated on Sunday - for the first time in 29 years - if Sunderland beat league leaders Leicester. Alternatively, Norwich, who are 17th in the Premier League table - 15 points clear of Villa - entertain fellow strugglers Sunderland at 12:45 BST on 16 April. If the Canaries avoid defeat in that game, Villa will be relegated. For 23 minutes on Saturday Villa were down before Jason Puncheon's 68th-minute winner for Crystal Palace against Norwich earned the Premier League's bottom club a temporary stay of execution. Aston Villa scored their first goal in seven hours and 36 minutes - an unsuccessful challenge by Joshua King allowing Idrissa Gueye to set up Jordan Ayew. Villa gave a full Premier League debut to 20-year-old midfielder Jordan Lyden - though he lasted only 45 minutes before being replaced at the start of the second half. By then the match was already as good as over for Villa following another performance in which they lacked leadership, character, fight and had only one shot on target. In contrast, Bournemouth, who welcomed back forward Callum Wilson after a serious knee injury, were bright and breezy. Lewis Grabban forced a full-length save from Brad Guzan before Cook's finish from a short corner on the stroke of half-time gave them the lead. The Cherries doubled their lead when Ciaran Clark was robbed by King, who went on to finish smartly - and although Villa went on to score a first goal in over seven and a half hours, the visitors held on comfortably. Bournemouth were tipped for relegation at the stat of the season yet they are challenging for a top-half finish after reaching 41 points with five games left. Joshua King has hit form at a crucial stage of the season. Having netted in wins over Newcastle and Swansea, the former Manchester United youngster made it three in five games with a sublime finish after dispossessing Ciaran Clark. Aston Villa caretaker manager Eric Black, speaking to BBC Sport: "Not going down today is a small consolation. We've conceded poor goals, but we have to remain professional until the end. "We didn't create as many chances as we would have liked. Ultimately, if you concede poor goals it will be hard to score. "I'm sure it's not easy to play in that atmosphere, but there have only been two or three victories here this season so I won't be criticising the supporters. "They turned out again today, which I find remarkable. This is certainly not down to the supporters." Bournemouth manager Eddie Howe, tells BBC Sport: "This was really important for us. It was very nervy from both teams but I thought we dominated the ball and deserved it in the end. "It was a difficult game to play in because of the toxic atmosphere. We made it that way with the way we started." Villa have made more errors leading to goals than any other side in the Premier League this season (14). Steve Cook has scored four Premier League goals this season - the only defender with more is Scott Dann (5). Joshua King has scored five times for Bournemouth this season - he managed just five league goals in three seasons in the Championship with Blackburn. Jordan Ayew scored his first Premier League goal since December, ending a run of 10 games without scoring. Villa's relegation will be confirmed if they fail to beat Manchester United at Old Trafford next Saturday - something they have not done since 2009. Bournemouth host Liverpool on 17 April. Match ends, Aston Villa 1, Bournemouth 2. 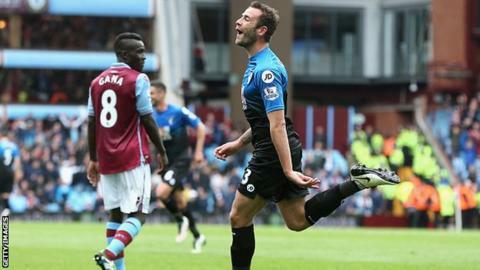 Second Half ends, Aston Villa 1, Bournemouth 2. Jordan Ayew (Aston Villa) is shown the yellow card for a bad foul. Substitution, Bournemouth. Callum Wilson replaces Joshua King. Corner, Aston Villa. Conceded by Steve Cook. Substitution, Bournemouth. Shaun MacDonald replaces Lewis Grabban. Goal! Aston Villa 1, Bournemouth 2. Jordan Ayew (Aston Villa) right footed shot from outside the box to the bottom left corner. Assisted by Idrissa Gueye. Attempt missed. Steve Cook (Bournemouth) header from the centre of the box misses to the right. Assisted by Marc Pugh with a cross following a corner. Corner, Bournemouth. Conceded by Leandro Bacuna. Corner, Bournemouth. Conceded by Ciaran Clark. Kieran Richardson (Aston Villa) wins a free kick in the defensive half. Corner, Bournemouth. Conceded by Joleon Lescott. Attempt missed. Ciaran Clark (Aston Villa) header from the centre of the box is close, but misses to the right. Assisted by Ashley Westwood with a cross following a corner. Corner, Aston Villa. Conceded by Andrew Surman. Goal! Aston Villa 0, Bournemouth 2. Joshua King (Bournemouth) right footed shot from the right side of the box to the centre of the goal. Substitution, Aston Villa. Adama Traoré replaces Scott Sinclair. Offside, Aston Villa. Ciaran Clark tries a through ball, but Rudy Gestede is caught offside. Attempt missed. Andrew Surman (Bournemouth) left footed shot from outside the box misses to the right following a set piece situation. Attempt blocked. Andrew Surman (Bournemouth) left footed shot from outside the box is blocked. Attempt missed. Matt Ritchie (Bournemouth) left footed shot from the centre of the box is too high. Assisted by Simon Francis with a cross following a corner.